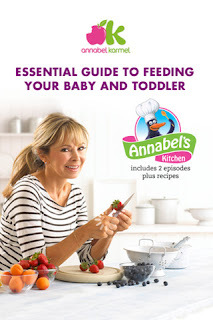 Last year I was asked to review the 20th Anniversary Edition of Annabel Karmel’s Complete Baby and Toddler Meal Planner book (see review here) and I loved the book. I have frequently used the book and Tristan has enjoyed lots of tasty meals that mummy has made him following the recipes in the book. As I love her book when I was asked to review her iPhone app I was eager to test it out and see if it was as good as her book. Best selling Author Annabel Karmel, renowned for her expertise about feeding babies and toddlers, has also created an iPhone app intended for parents with babies from six months through to toddlers. 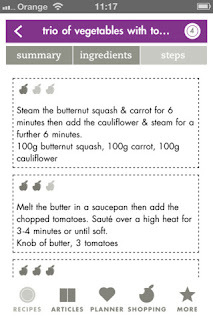 Annabel Karmel says "This App brings my recipes to life. Not only does it offer parents 100 of my favourite new recipes but also advice and guidance on simple cooking techniques to help make their lives easier and provide good, nutritious food for their babies and toddlers." Unfortunately I don’t have an iPhone even though I would love one (I would happily accept any kind offers to give me an iPhone ;-) sadly don’t think I will be that lucky!) but thankfully this app also works on the iPod Touch which I was able to borrow from a family member to use for testing this app out. Some of the recipes also have a video showing Annabel cooking the recipes with handy cooking tips and the app has ‘how to’ guides for cooking techniques such as how to peel a butternut squash and how to skin a tomato which is very useful if you aren’t sure how to do those things. The recipes are easy to understand and follow for cooks at all levels of cooking ability and experience. Within the ingredients list there is an option to add ingredients to the ‘shopping list’ and within the shopping list you have the ability to delete items that you already have in the kitchen saving you from buying ingredients that you already have. I love that you can create a shopping list with this app; it saves writing ingredients down from a recipe book. I usually write my shopping list on a bit of paper that inevitably gets lost in my bag which means I often miss out an essential ingredient but with the shopping list on the iPhone/iPod Touch this would not be a problem (the only problem I have is the lack on an iPhone). The app is great for helping parents through the weaning journey; it provides advice and guidance on baby’s first foods, essential equipment, cooking methods, food preparation and storage, freezing meals, allergies and fussy eaters. This advice is very helpful, especially for parents with not a lot of cooking experience. Another special feature of this app is the interactive meal planners. You can read Annabel’s planner which focuses on the stage you are looking at with a weekly menu or there is the option of creating your own planners. You can add recipes to either planner within the summary section of the recipe. 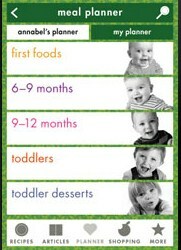 The planners are great to help parents keep organised and make feeding little ones less stressful. As well as meal planners this app allows the option of increasing portion sizes which is great as it saves working out amounts if you want to make more. Tristan was weaned from 20 weeks of age and started with baby rice and pureed foods, from around 6 months of age he moved onto finger foods and now loves feeding himself. I like to cook him a variety of textures and tastes, encouraging his desire to feed himself. 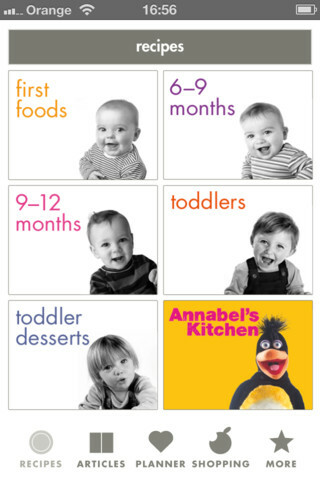 I used recipes from both the 9-12 month and toddler sections, as well as following the recipes I also adapted and changed some for further variety. Tristan loved the mini meatballs and the crunchy salmon fishcakes were a big hit too. I liked how I could freeze some meals making it easier and more convenient to feed Tristan home-made healthy and tasty food. I liked this app and it didn’t disappoint, it was very easy to use and contained an assortment of recipes so you can give your little one a healthy and varied diet. Tristan loved the recipes I made for him using this app as a helpful guide and it was handy to see new ideas of what to feed him using this app rather than looking through a recipe book. 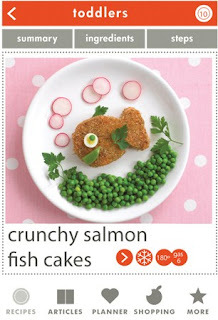 The recipes are easy to make which is great when you’ve got a little one needing your attention. I think this app is fantastic for first time parents about to wean their baby, the first foods section is great for parents who are weaning their little one with pureed food and the helpful articles on foods to avoid and allergies are a great resource for parents. Even though I don’t think this app is as useful to parents who are ‘old hands’ at weaning compared to new parents I do think it would provide new recipe ideas to all parents helping them give their babies and toddlers a wide variety of meals. 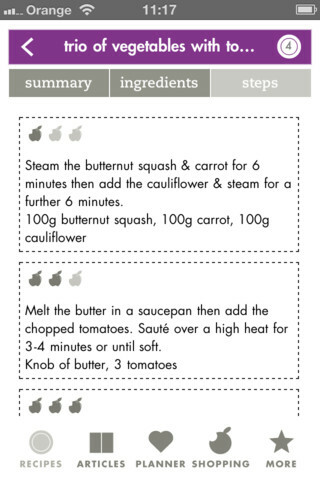 The shopping list function and meal planner is brilliant for busy parents. As it is an app that covers a range of ages it doesn’t have as many recipes or information as books but what recipes and functions it does have is fantastic. The Annabel Karmel app can be purchased on itunes for £3.99 which I think is great value for money. This new updated app also includes episodes from Annabel’s Kitchen, her entertainment show on CiTV. 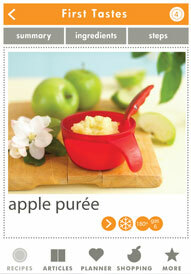 It is fun and quick to use and a great tool that helps busy parents. I would recommend this app and even though I personally wouldn’t need to use all features of the app as I already know the cooking techniques I still think it is a great app for the features I would use, so if I had my very own iPhone I would definitely purchase and use this app.